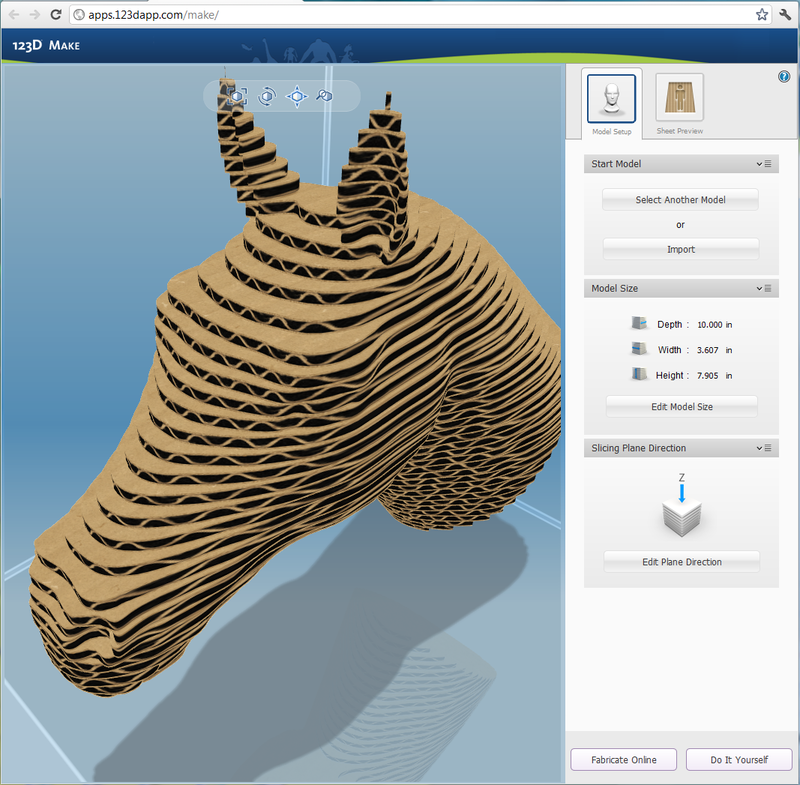 The new web version of Autodesk 123D Make is another example of cloud services provided by Autodesk. 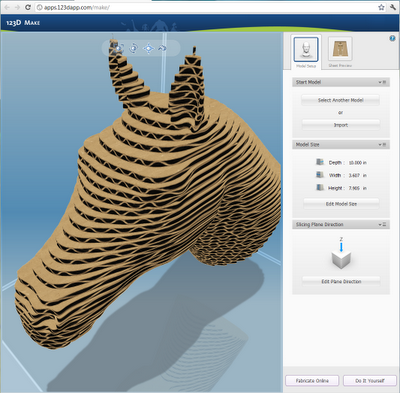 The application 123D Make is a part of the "DIY" family Autodesk 123D. You can use these 3D applications - for free - for 3D scanning/capturing (123D Catch), modeling (123D), sculpting (123D Sculpt) and fabrication (Make 123D) of real-world 3D objects. The applications "123D" are available since May 2011 and are continuously improved since then. So far, the most popular components of this set was the 123D Catch (former PhotoFly) for creating 3D models from photographs, and the free 3D modeler 123D based on Inventor Fusion. 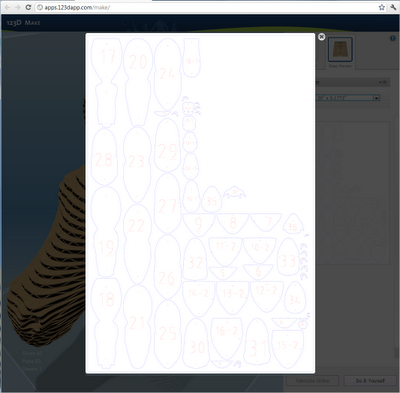 The application 123D Make was previously available only in a version for Mac, so its audience was quite limited. 123D Make is now available as a web application so it can run directly in your web browser (recommended: Google Chrome or Firefox) from apps.123dapp.com/make. Any 3D model can be used in 123D Make - it will slice the model into a pattern of flat parts that can be cut and assembled back into the model. 123D Make generates a plan (drawing) of the individual numbered 2D slices. In the USA, you can have the resulting slices laser-cut and sent the manufactured ​​cardboard kit via a 3rd party vendor. 3D models can be imported in the STL format (stereolithography), the same format as is used for 3D printing. 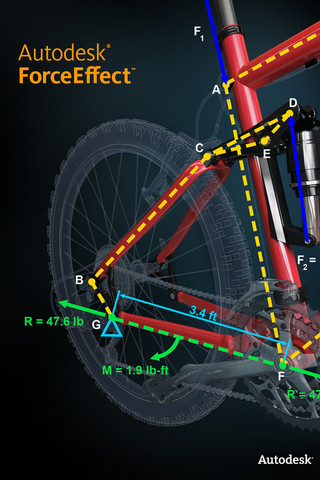 STL format can be exported from AutoCAD, Inventor and other 3D CAD software. The resulting 2D drawings (nested laser-cuts) can be downloaded in the EPS format. Try it yourself - it is fun. Autodesk is not only a leading developer of CAD, GIS a multimedia desktop software, they develop also many interesting mobile applications for the growing market of Android smartphones, tablets, and Apple iPads and iPhones. There already 14 of these apps. The newest kid in this block is the mobile engineering application Autodesk ForceEffect 2.0. This innovative piece of software can be used on an iPad, iPod or iPhone to sketch a mechanism (e.g. on a background photo) and simulate the loads, reactions and force distribution in this mechanism. So you can quickly locate a possible problem or evaluate your engineering ideas and concepts. You can specify the individual forces (points), or add a force evenly distributed along an existing element at any angle. Element weights can take part in reaction calculations. Data can be stored in your Autodesk Cloud Documents web storage space, together with your other CAD data (from AutoCAD, AutoCAD WS, Inventor Publisher Mobile, etc.). ForceEffect is free for a limited time. Two other Autodesk mobile applications were just awarded in "Best App Ever Awards 2011" - SketchBook Pro won in the category "Best Artistic App" and Pixlr-o-Matic won in the category "Best Photo Editing App". Most of the Autodesk mobile applications are free or almost free, for a symbolic price. You can download them directly from your mobile device, from the respective store - Apple Apps (iTunes) or Android Market. The CAD Studio company, supplier of CAD/CAM/CAE, GIS and PLM solutions in Central Europe, has reported a 2011 turnover exceeding 244 million Czech Crowns (9.6 mil. Euro). The year 2011 was the first full year of CAD Studio's presence on the Czech and Central European CAD market. Economic results of the year 2011 confirmed success of the recent merger. The best results were achieved in the area of product data management (PDM) - with an 55% increase (Y/Y) in license sales - and in the area of geospatial solutions (GIS), where customers have purchased even 79 percent more licenses over the previous year. A number of interesting implementation projects were successfully completed in 2011. Customers have positively adopted entirely new types of products introduced to the Czech market in 2011 - such as AutoCAD Plant 3D for piping design and Autodesk Simulation for CAE simulation and analysis of digital prototypes.